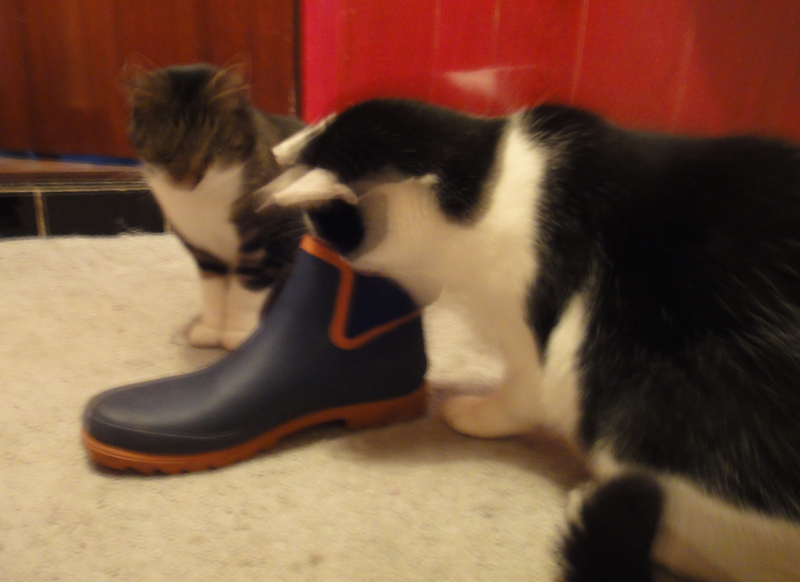 I thought I was being helpful by taking the plastic cap out of my boot when I saw the cats struggling to get it out; however, they wouldn’t play with it again until I put it back in the boot. I think cats really like pretending they don’t know/see certain things, like: they’ll play with a ball and then leave it alone…pretend it’s not there and then attack it from the side! 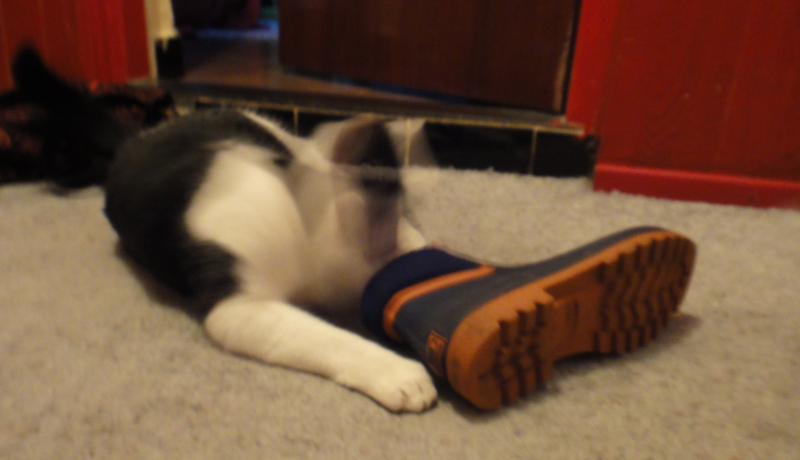 Or they put things in boots just so they can pretend to ‘catch’ it. Rudy got a hold of another shrew, but this time it was even itty bittier than the proper-sized ones. Its eyes weren’t even open yet! 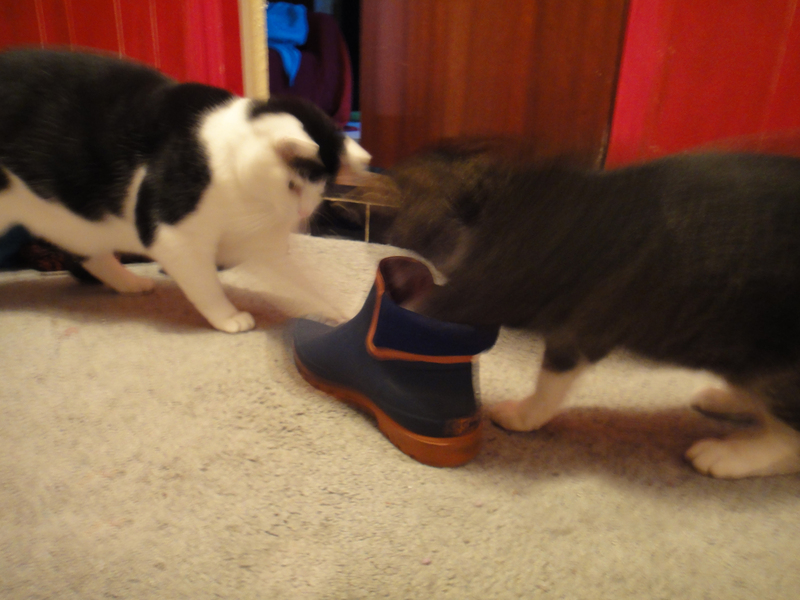 Luckily, I didn’t see any marks on it from Rudy the Killer Whale Cat. I cradled the little guy in the palm of my left hand, scooted the cats inside. Scoot. Then, what I would imagine, looked extremely comical —or strangely sad— was me embarking on Mission Find Momma. Every. single. little. squeaky. noise. was. her. I know what they sound like now,after having to save them from my cats so many times. Mercy! Why don’t they just find somewhere else to live. Anyway, I careened haphazardly around the backyard —avoiding stinging nettles and the giant slugs that creep out at night (last thing I wanted to do was step on one) listening and watching…looking for momma shrew. It was getting dark. I brought the shrew inside with me and typed with one hand, searching the internets for an answer: “found a baby shrew”, “take care of newborn shrew”, etc. So, I went to a hidey hole I have suspected of being a shrew den (? ), laid a bunch of green and dried vegetation around it, put the baby shrew on it and lightly covered him with dried bamboo leaves. Then, I placed a big plastic pail upside down and made sure the hole, the baby and a getaway on a couple of sides were all secure and I topped the bucket with heavy rocks, so the jerk neighbour cat (who beats up our little Lois) couldn’t get the shrew. I hope he is gone when I check him in the morning…down the hidey hole with its wee family. Night night little guy. This is the little nature bed I made for the little shrew. Big slugs carousing around at night. UPDATE: Well, I didn’t expect much when I went to check on the little shrew, but he was still there: still breathing and moving. I scooped him up again and we sat in the sun for awhile. I gave him tiny amounts of water from a syringe. We just sat. He squirmed. His breathing was shortened and he wasn’t doing well. Tough little critter though, lasting the whole night. But he finally just faded. It broke my heart. I knew how it would end, but it still squeezed my soul. I buried him. Made another giant doily rug: This one was made with wool and it makes me really happy for some reason! Rudy on the huge doily. As soon as I started knitting and crocheting, I said aloud —on more than one occasion: “But you won’t catch me making any doilies”. It’s my first one. I plan on making more styles and other colors. What do you think?! There has been a male cat skulking around our place for the past few months. We had dubbed him Big Rudy because at the time he was first making his presence known he was bigger than our Rudy and he is black-and-white-splotchy like our Rudy. Big Rudy is now smaller than the real Rudy. He’s definitely a loner and definitely a stray: He’s been on his own for a long time, I’m sure. I need a new name for him. ANYWAY, like usual, I need to make him my friend so I’ve been slowly managing to shrink the gap he allows between us. Today, was the closest yet…about three metres. Then, tonight M says, “There’s a cat out there we haven’t seen before.” Sho-nuff, there was. A sweet, tiny, wee cat…so pretty. I hung out with her and she eventually came over and did the cat face-nudge thing and allowed me to pet her. !!! She was super skinny, but I think she was also a pretty recent mommy-cat. I gave her some food and water in the shed and made a comfy box for her to stay out of the rain. But every time I looked out the window, she was sitting back out front where M first spotted her under the (dry) cedar trees. And me being the sucker that I am, kept going out to pet her and make nice-nice. I’ve already named her Clementine.